– Put together water, onion, carrot in the pot and bring it to boil. the meatballs) .This will be your lovely aromatic broth. – Transfer Pork And Prawns dumpling on baking tray and put it in the 200 Fahrenheit until cooked, usually 15-20 minutes. – Throw in chopped garlic and flash fry in the same pan which you just fry the dumplings. Turnthe hob off and keep this Garlic oil on the side. – Meanwhile, cook the noodles according to the package instructed. Please do not to over cook the noodles. – Drain water and transfer noodles into serving bowl. 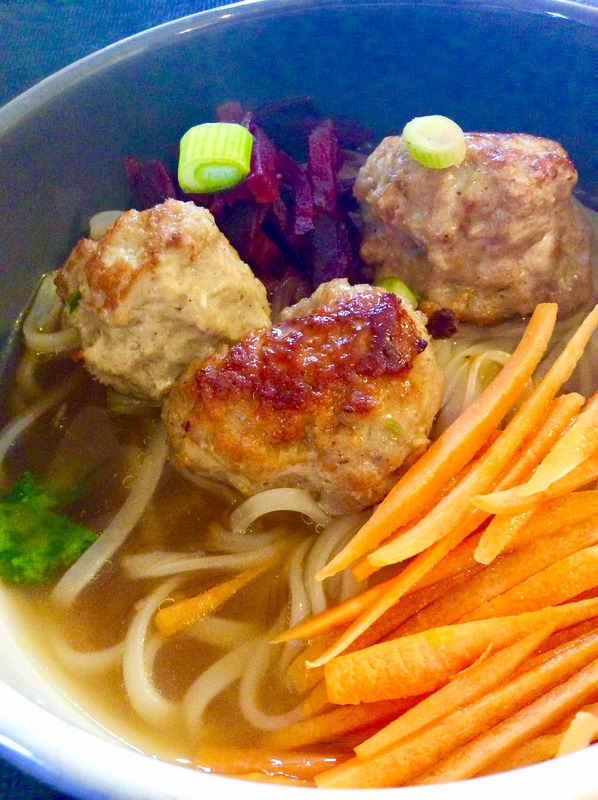 Assemble the meatballs carrots and beetroot on noodles. Then pour in the broth( preferably strained all the herbs and vegetable out). – That’s it ! Pork And Prawns Dumpling Noodle Soup is ready for you to enjoy.